Want a new beach body? 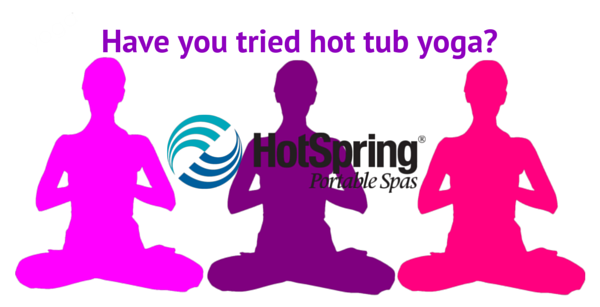 Try Yoga in a Hot Tub! May 10, 2017 – Is it spring yet? Yes, it is! And summer is just within sight. So are those extra pounds you packed on during the winter when you were a denizen of the indoors and eating was your exercise. What to do… what to do…?? Here’s an idea…hot tub yoga! If you practice yoga, or you’ve thought about it, here’s a twist: try doing yoga in a hot tub. It’s a totally different angle that’s refreshingly new and offers three benefits to help you drop a few extra pounds. • The first benefit is actually a two-for-one. Soaking in a hot tub increases your blood flow. That aids in digestion, and it also gives your metabolism a boost. • Imagine a floating yoga pose. That’s what you get in a hot tub. The buoyancy and temperature of the hot water can help your caloric burn rate and strengthen your core. And by working within another dimension (literally) you’re able to hold postures for longer periods and longer breaths. • When you pair slow breathing with hot water, it takes relaxation to an entirely new level, and the stress just floats way. Taking full, slow breaths enables you to double-down on the typical stress release of a good yoga session. • Don’t eat just before your workout. It doesn’t mix well with hot water. Stay away from foods with high-fat content, and eat smaller, lighter meals before your session. Don’t consume caffeine, sugars, or processed foods. • To keep your body well hydrated, choose fruits and vegetables with high water content. Some of our favorite veggies are broccoli, cauliflower, cabbage, kale, Swiss chard, and arugula. For fruit, we suggest watermelon, kiwi, cantaloupe, honeydew, cherries, and grapes. • When you’re in hot water, drink lots of water. We suggest a few tall glasses before your session, continuing during the workout, and then afterward. • You’ve had a good workout, and now you deserve a reward. The following foods are great choices for your post-workout recovery: high fiber whole grain foods, greens, and lean proteins. Caffeine free beverages including peppermint, ginger, or chamomile tea are also good options. Ready to float your cares away? Mix it up a bit and try yoga in a hot tub. It’s good for the mind, the soul, and the body, especially if you’re hoping to have a little less body before the sun comes out.